-The client care coordinator serves as a primary contact for our senior clients and their family members at all stages of the service relationship. -Some of the functions are conducting pre-service assessments, developing and implementing service plans, managing safety and risk in clients’ homes, and performing regular in-home quality assurance visits. -You must be a licensed driver with current insurance as the job involves many home visits with our clients throughout Beaverton, Tigard, Tualatin, and Sherwood. On-the-job mileage is reimbursed. -The client care coordinator reports directly to the agency director and offers critical insights to improve our service delivery. -Social Work Background: Master of Social Work (MSW) degree is strongly preferred. -3 years of solid work experience in health care social services is required. You must have experience with and a love for seniors. -You must be organized, have good time management, be a critical thinker, and have a strong working memory to be successful in carrying a client load with Home Instead. -Your strong abilities with both written and spoken language are keys to effectively coordinating with office staff, CAREGivers, clients, and client representatives. -Persuasive Skills: Pre-service assessments are opportunities to engage families, determine their needs, and present our service as valuable solution. At least of 8 out of 10 of your pre-service consultations should result in new client service. -Assess needs of prospective clients and help them start up services with our agency. -Keep clients and their representatives happy and on active service through excellent communication and regular quality assurance visits in their homes. 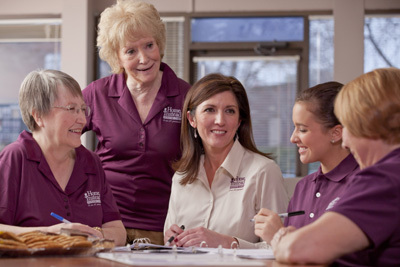 -Support CAREGivers to successfully and safely provide of care in client homes. -Maintain focus on the performance metrics of your role. Understand and embrace that this is a people business that is also driven by numbers. -Keep excellent records through designated systems and forms. Contribute to the development and documentation of processes applicable to your role. -This position will be a 40 hour per week opportunity (8am to 5pm, with 1-hour lunch). -Around $25 per hour. Open to discussion and negotiation. -$3,000 to $4,000 available per year in performance bonuses. -Highly supported 90-day training period. -We work as an inter-disciplinary team to deliver personalized service to our clients and their families. -We communicate with empathy, integrity, and respect. We operate from a platform of defined values and keep ourselves accountable to adhere to those values. -We have a family friendly business philosophy that balances the personal well-being of employees with business objectives. -We have cultivated a work atmosphere that encourages growth and learning and supports you to be your best, both professionally and personally. -We are grateful to be an industry leader, not just in the Portland area, but throughout North America. The TV ads will warm your heart! Please enter your contact information, upload your resume, and submit a cover letter explaining why you feel you are a good fit for the job. We will contact you shortly for a phone or in-office interview, or you will receive other communication from us via email. Thank you for your time and attention. We are excited to meet you!